WHEN MAURINA BEADLE WAS CARRYING HER SECOND CHILD 20 years ago, the doctors told her she should terminate her pregnancy. The fetus was showing signs of hydrocephalus, also known as “water on the brain.” As excess fluid builds up in the brain, it places abnormal amounts of pressure and stress on important regions, and can cause varying degrees of brain damage, including mental retardation, different forms of motor disability, cerebral palsy, and death. It didn’t dissuade Beadle. She gave birth to her son, Jeremy Meawasige, on December 9, 1994. The doctors were right. Jeremy was eventually diagnosed with hydrocephalus, cerebral palsy, spinal curvature, and severe autism. He has required around-the-clock care since birth. He can’t walk on his own without the support of others, he can’t eat on his own, he is incontinent and needs to wear a diaper, and he isn’t able to speak or write. He has very limited means to communicate with others, and he doesn’t make eye contact with people he doesn’t know. Only those who are close to him, like his mother, can understand what he wants or needs from the sounds and movements he makes. “When Jeremy slept,” says Beadle, “that’s when I took a sleep. Whenever he was awake, I was awake with him. And if he fell asleep in my arms, then I would fall asleep too.” Sometimes, he’s self-abusive. Once, when he was about 15, he repeatedly smashed his head against the wall so hard that he was in a coma for four days. Beadle says he looked like Sylvester Stallone coming out of a boxing match. The doctors told her they would have to drill a hole into his head to release the fluid build-up resulting from the trauma. Luckily, as they were preparing the operating room, Jeremy woke up from his coma, narrowly dodging the invasive surgery. Beadle also has another son, Jonavon, six years older than Jeremy. But taking care of her second son has been her full-time job since the day he was born. While Jeremy was growing up, the family didn’t spend much time at home, not even during Christmas holidays. He was often ill and was hospitalized numerous times—too many to count. Beadle can’t remember going longer than one month between hospital trips. Jeremy’s immune system is extremely weak. When he catches something (a bacterium or virus that a healthy child could easily fight off) it could turn serious, requiring a hospital stay or even surgery. His shunt system, put in place to treat his hydrocephalus, is largely to blame. The long tube transfers the excess fluid in his brain to his abdominal cavity where it can be properly absorbed. An infection could travel to the shunt tubing, infecting it too. When this happens, surgeons have to remove the old shunt, clear the infection using antibiotics, and then put in a new shunt. Every day, Beadle has to help Jeremy dress, shower, change diapers, and spoon feed him his meals. She also has to keep a vigilant eye on him to make sure he doesn’t hurt himself. She spends a lot of time singing with him, which she says is the one thing that always makes him smile and laugh. It has never been easy. Beadle and her two sons live on Pictou Landing First Nation reserve, a two-hour drive from the hospital in Halifax, called the IWK Health Centre. Beadle always took Jonavon with her on the long trips, both of them sleeping in a cot beside Jeremy during the extended hospital stays. In those early days, Beadle tried to get part-time help to take care of him. She would write to the local health centres to ask for support and fill out all the necessary forms, but help never came. Eventually, Beadle gave up hope. She carried on, as a single mother of two, doing the best she could to keep her sons happy and safe. She needed help. But as an Aboriginal family living on a reserve, help was hard to get. IF BEADLE AND HER FAMILY DIDN’T LIVE ON A RESERVE, GETTING home care and caregiving support would be a much easier process. She could have reached out to her provincial Disability Support Program. From there, the provincial program would do an assessment of their needs, and then provide the necessary financial support. As far as hassles go, it would only be a small one—and more importantly, there would be scant delay between contacting the program and receiving support. Things are a lot more complicated when a person lives on a reserve. The federal government, rather than the provincial government, funds health and social services on reserves. The federal government provides funding through block contribution agreements to a reserve’s band council, which is the elected government of a particular First Nation—in Beadle’s case, the Pictou Landing First Nation. The band council then decides how the money is spent. In theory, the band council is supposed to receive enough funding to provide care and services at a level similar to what is available to off-reserve residents in the same province. But problems arise when there simply isn’t enough money in the budget. The person in charge of delivering health care services on Pictou Landing First Nation reserve is Philippa Pictou, the health director. When she found out about Beadle and Jeremy’s situation, she insisted he receive daily at-home care immediately, even though she knew it would quickly eat up the entire health budget. She hoped there would be a way to obtain extra funding and, in the meantime, asked the province of Nova Scotia to send a nurse to perform an assessment—she wanted to know what level of care the family would receive if they lived off-reserve. The assessment was performed in October 2010, after which Beadle’s 24/7-hour care was reduced to 8:30 a.m.–12:30 p.m during the week, and 24-hour care over the weekend. The care services still cost about $8,200 per month, nearly 80 percent of the band council’s entire monthly budget for personal and home care services. For a small reserve of 600 members, it was unsustainable. Pictou asked the two federal departments responsible for funding home care, Indigenous and Northern Affairs Canada and Health Canada, to top up the band’s funding. But both departments denied her request and told her it was up to the band to properly budget for the extra costs. “It became clear,” says Pictou, “that Jeremy was already starting to get treated differently than if he was living off-reserve.” In 2012, Beadle and the Pictou Landing Band Council took the federal government to court, demanding the right to be treated equally and to receive the services band members needed—and deserved. The decision to fight the federal government was easy for Beadle. She knew it was the right thing to do, not just for herself and her son, but also for all the First Nations children across Canada. And, it wasn’t just about equal treatment of children on- and off-reserve. Jeremy’s case connected to a wider issue that’s deeply gutted First Nations communities across Canada: the forced removal of First Nations children from their homes and communities, often as a direct result of low funding and services on reserve. The battle was going to set a legal precedent one way or another. If Beadle and the band council won, it would give First Nations families a better chance in the future to access services at a level equal to their off-reserve counterparts. More children would be able to stay at home, instead of given up to foster care or institutions. If the federal government won, it meant current funding agreements with First Nations communities didn’t need to allow for exceptional circumstances that warranted additional funding. Everything would remain the same—if not worse—for First Nations families. BEADLE SPEAKS WITH A SOFT YET EXCITED VOICE. SHE ISN’T ONE TO dominate a conversation. Her home on the reserve is a small, minimally-furnished bungalow, which she shares with both her sons. When I visited her, it was during the dead of winter in February, just ahead of a massive snowstorm. Everything seemed a little dreary. Houses on the reserve are spaced far apart—not like in wealthier Canadian neighbourhoods, where the space is for meticulously landscaped yards and gardens, but haphazardly, with unplowed snow-covered roads connecting them. Life is generally quiet for Beadle and her family, especially during the winter months. Going outside meant risking infections for Jeremy. The only time Beadle stepped outside the day I was there was to huddle in front of her door to smoke a quick cigarette. The events post-stroke, she tells me, disrupted her family’s life, but also put a strain on the entire community. While looking for a way to relieve that strain, Beadle and Pictou discovered Jordan’s Principle. A child-first principle adopted by the House of Commons in a unanimous vote in 2007, its intention is to ensure jurisdictional disputes don’t cause First Nations children to experience delays, disruptions or denial of services available to other children. The principle is named after Jordan River Anderson, who was born in October 1999 on Manitoba’s Norway House Cree Nation reserve. Thanks to an extremely rare neuromuscular disorder called Carey-Fineman-Ziter Syndrome, Jordan spent the first two years of his life in a Winnipeg hospital, 800 kilometres away from his home. When he was two years old, the doctors decided he was ready to leave the hospital, provided he had special home-care services. This led to a long fight between the provincial and federal governments over which was on the hook for the bill. They argued over high-cost items, such as home renovation needed for installing a wheelchair ramp, to very low-cost items, like a showerhead. The dispute lasted for over two years until 2005, when Jordan died in the hospital at five years old, having never spent a single day at home with his family. 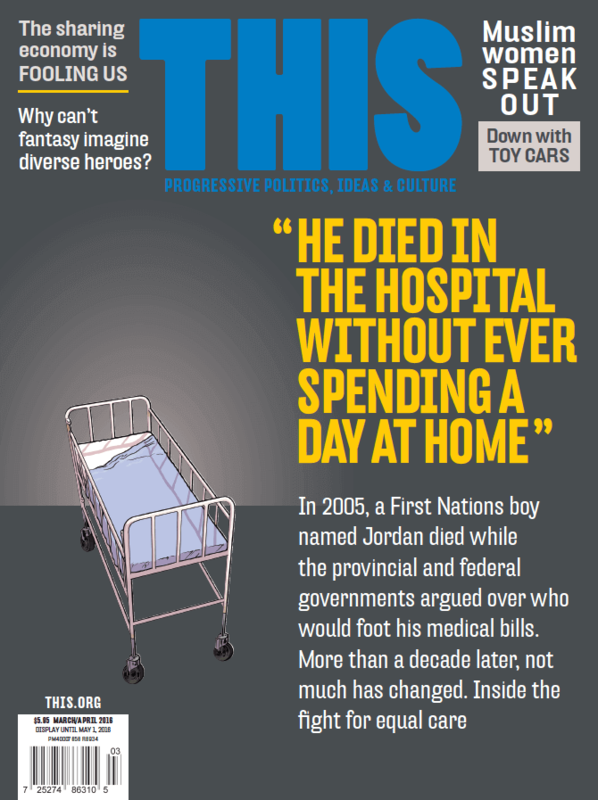 If Jordan were a child living off-reserve, the province would have immediately covered the costs to provide home-care for him. Yet in 2011, four years after the historic vote, neither Beadle nor Pictou could find a single successful application of the principle in Canada. It seemed clear to them that Jordan’s Principle should apply to—and, therefore, help—Jeremy. Under it, the first governmental department a family approaches should foot the bill for necessary and eligible care and services. If the principle had been properly implemented in Jeremy’s situation, the provincial government should have provided services immediately after its nurse’s assessment of the family. It could negotiate with the federal government over costs and reimbursement later, on its own, in the background. Devastatingly, after many meetings with provincial and federal officials to discuss Jeremy’s case, the federal official in charge of implementing Jordan’s Principle in Atlantic Canada decided it didn’t apply. Both the province and the federal government agreed the amount of care requested exceeded the provincial normative standard of care, a maximum of $2,200 per month. Thus, since the two governments weren’t technically in dispute, it wasn’t a Jordan’s Principle case—help hinged on the two governments battling over costs. As an alternative, the governments suggested Beadle place Jeremy into a longterm institutional care facility. They promised all the costs of his care would be fully covered by either the federal or provincial government. The estimated daily cost of institutionalized care for Jeremy was $350 per day. The cost to keep Jeremy at home was roughly $270 per day. Beadle was horrified. It felt like the government would rather spend more money to take Jeremy away than to spend less to help her keep him home. There was no way she would give up her son. Court was her last chance to save him—and to broaden Jordan’s Principle so it could finally help children on reserves. This belief has led to her own legal battle. In February 2007, the First Nations Child and Family Caring Society of Canada and the Assembly of First Nations launched a human rights complaint against the federal government. It’s the first time in history a country has been held accountable for its present day actions towards an Indigenous population. The complaint alleged the Canadian government discriminates against First Nations children like Jordan and Jeremy by providing them with less child welfare funding than other children in the country. The government’s own documents estimate the funding gap between on- and off-reserve child welfare services is at anywhere between 22–34 percent. Hearings for the case took place in front of a three-person panel at the Canadian Human Rights Tribunal and concluded in October 2014. At the crux of the tribunal hearings: that the Canadian government provided flawed and unequal services to First Nations children, and that it failed to implement Jordan’s Principle. The ripple effect, argued Blackstock and her allies, meant First Nations families were often forced to surrender their children to foster care or institutions. First Nations children are 12 times more likely to be placed in foster care than non-Indigenous children. They account for 30–40 percent of all Canadian children in child welfare care, even though they make up only five percent of the Canadian child population. What Blackstock wanted was the same thing Beadle wanted: the right and ability to keep First Nations children at home and in their communities. In the end, Beadle’s case reached its conclusion before Blackstock’s. After spending $300,000 to win its case, the federal government lost. The court ruled in favour of Beadle and the band council in April 2013. The judge agreed with Beadle that the federal government made the wrong judgement on Jeremy’s case, and that Jordan’s Principle did apply. The provincial government, as dictated by the Social Assistance Act, would, in fact, have to cover Jeremy’s care costs if he lived off-reserve. And thus, the federal government should cover those costs to ensure equality for First Nations children living on a reserve. The court ordered the federal government to reimburse the band council for all legal costs, the fees for the services Jeremy had been receiving since Beadle suffered her stroke, and to cover all future costs related to his care. It was the first time Jordan’s Principle was successfully applied in Canada. And the only time. The Canadian government has made it virtually impossible for families to apply for Jordan’s Principle. First, a narrow definition of qualification exists. A child must have multiple complex health care needs—not just one or two, but many. Second, there’s still the sticking issue of what constitutes a dispute and who it is that must be feuding. That is, if two federal departments, like Health Canada and Indigenous Affairs, couldn’t agree over which should cover the costs of a service, the principle would not apply. And finally, there is just too much red tape to access services using the principle. Even though Beadle won against the government and now has the support she needs to keep Jeremy home, she knows the fight isn’t over. She thinks about how Jordan River Anderson died and knows that he is dead because the principle that’s his namesake didn’t exist when he was alive. She wonders if it would have helped him even if it did. AFTER SEVEN YEARS AND NUMEROUS EMOTIONAL TESTIMONIES across Canada, the Indian Residential Schools Truth and Reconciliation Commission published an executive summary of its final report in June 2015. Number one on its list of calls-to-action was to reduce the number of Aboriginal children in care. Number three was to fully implement Jordan’s Principle. The statement was clear: the inequality faced by children and families living on reserves today perpetuates the horrific legacy of Indian Residential Schools. This is the news that Blackstock, Beadle, and all the other advocates for First Nations children across the country have been waiting for—a wait that has spanned decades, and involved years of hard work. Yet, although there has been a lot of excitement rippling through First Nations communities across Canada, it has been accompanied by a certain level of skepticism. It will take years to tell whether the ruling will actually change the realities of First Nations children and families. If it does, Canadians should see the number of First Nations children in foster care or institutions fall to a level that is proportionate to their population size. Raised in Surrey, B. C. and Hong Kong, STEPHANIE LAW is a journalist (M.J., University of British Columbia ’12) and epidemiologist (M.Sc., McGill University ’10). She has done years of research on HIV/AIDS and tuberculosis in impoverished communities, and has worked with oppressed and marginalized communities in locations around the world. Are there health risks of radiation from cellphone towers?